Peugeot added upscale features to the new 308 without raising the starting price compared with the old version. With the new 308 hatchback, Peugeot thinks it has a worthy rival to the Volkswagen Golf, Europe's best-selling car. "Not only does the 308 offer a better driving experience compared with the Golf and other cars in the segment, its design is more attractive and sporty," 308 Project Leader Laurent Declerck said. How has the 308 improved? It has a sleeker design, lower emissions and offers a noticeably better driving experience. The car's roofline is 40mm closer to the ground than on the predecessor model, and, with an increase in track width, the center of gravity is 2mm lower. Front end LED lights and a chrome finish on the front grille distinguish the 308's exterior from the less-round and more staid design of its predecessor. The 308 offers one of the most technically advanced touchscreen infotainment systems on any new car, Peugeot says. What is the sales target in Europe? More than 150,000 units in 2014. Some drivers may not appreciate the small steering wheel. An acceleration of 0 to 100kph in 8.0 seconds is unexceptional and a mismatch with its sporty design. The 308 is the brand's No. 2 seller in Europe after the 208/207 subcompacts, so its success is key to Peugeot's plan to push the brand upscale to earn higher margins. To make the 308 more competitive in the hotly contested compact segment, the car offers an upscale design and driving experience, and a quality build that is at least up to "the German standard," Declerck said. 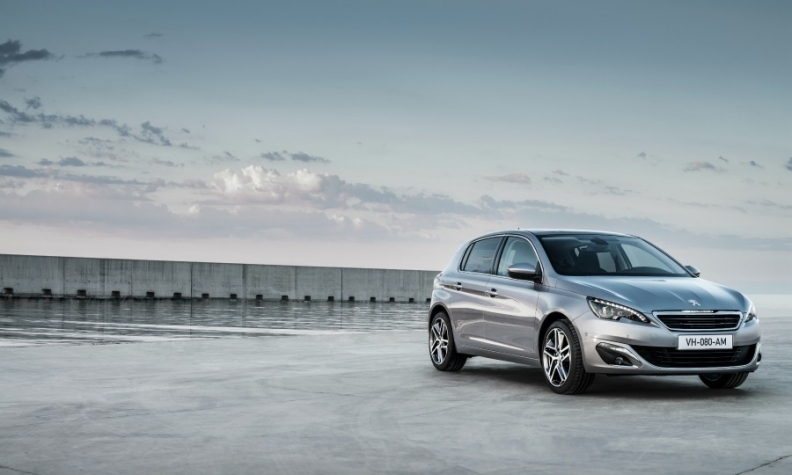 The 308's starting price "is the same or lower than its predecessor despite the premium-like features," he added. The 308 and the Citroen C4 Picasso are the first two models underpinned by PSA's new Efficient Modular Platform (EMP2). The new platform helps cut the 308's weight by about 140kg compared with the old model, which was launched in 2007.